Here are some reasons why you might be seeing less hair on your head. Any kind of physical trauma - surgery, car accident, severe illness, flu etc - can cause temporary hair loss (telogen effluvium). 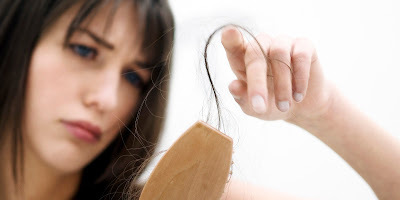 Hair loss becomes noticeable 3-6 months after the trauma. What to do: Your hair will start growing back as your body recovers. This usually occurs after the baby has been delivered. It's possible that the decreasing weight is stressing your body out, or if you're not eating right, it can be a result of vitamin or mineral deficiencies. However, loss of hair together with noticeable decreasing weight may be a sign of an eating disorder such as anorexia or bulimia. What to do: Sudden weight loss can shock your system, and there will be a 6-month period when you'll experience hair loss, but it will eventually correct itself. It is less likely to cause hair loss than physical stress, but it can happen, e.g. in situations of divorce, death or caring for an ageing parent. What to do: This type of shedding will eventually abate. According to the American Academy of Dermatology, overconsumption of vitamin A-containing supplements or medication can trigger hair loss. What to do: Once you stop consuming the excess vitamin A, hair should grow normally. What to do: Find natural vitamin B in fish, meat, starchy vegetables and non-citrus fruits. Eating a diet with plentiful of fruits and vegetables, lean protein and "good" fats such as avocado and nuts is also good for your hair. Supplement with natural, wholesome vitamin source which can be found in Yung Kien Pollen. It contains almost the whole spectrum of the B-group vitamins, including B1, B2, B3, B5, B6, B9 and B12. According to the American Academy of Dermatology, if you don't get enough protein in your diet, your body may ration it by shutting down hair growth. This usually happens about 2-3 months after a drop in protein level. What to do: Great sources of protein include fish, meat and eggs. If you don't eat animal products, try Jia Hor Soya Protein. It is enriched with lecithin as well as papain and bromelin enzymes which combine to give a high quality protein source. Female pattern hair loss, called androgenic alopecia is the female version of male pattern baldness. What to do: Like men, women may benefit from minoxidil to help grow hair, or at least maintain the remaining hair. It is available over the counter. Switching or going off birth control pills can also cause telogen effluvium. The change in hormonal balance that occurs at menopause may also have the same result. The androgen receptors on the scalp become activated and the hair follicles will miniaturise causing more hair loss. What to do: Consult your doctor about other birth control options or undergo bioidentical hormone therapy for menopausal women. Taking Yung Kien Pollen has been proven to successfully handle cases of menopausal disturbances. Almost 1 in 10 women aged 20-49 suffer from anaemia due to iron deficiency. What to do: A simple iron supplement should correct the problem. Increasing your dosage of Yung Kien Pollen is also an excellent solution. This is the medical term for an underachieve thyroid gland. It produces hormones that are critical to metabolism, growth and development. When the gland is not producing sufficient hormones, it can contribute to hair loss. What to do: Many research have shown that Lingzhi can be used to treat thyroids condition. This article explains how - Thyroidism and Lingzhi. 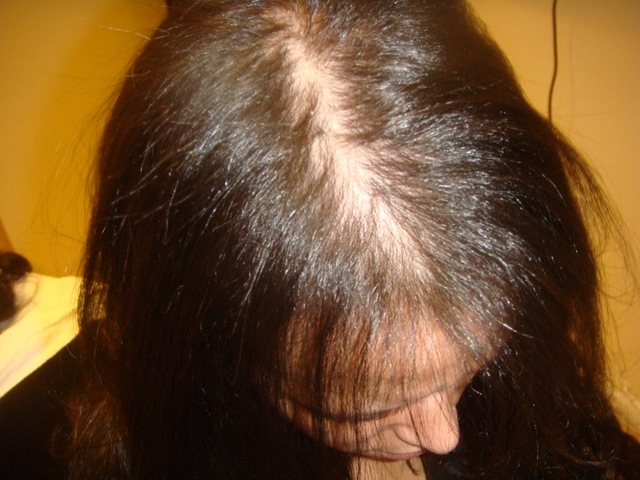 This is also called alopecia aerate and is a result of an over-active immune system. It appears as hair loss in round patches on the head. The immune system sees the hair as foreign and targets it by mistake. The course of the condition can be unpredictable, with hair growing back, then falling out again. What to do: Lingzhi and related Shuang Hor products have been shown to modulate the immune system so that it will not mistakenly attack your hair. This article explains how it works - Immune Modulation. One specific type of autoimmune disease that can cause hair loss is lupus. This type of hair loss is called "scarring". The hair won't grow back. What to do: Try a new hairstyle to camouflage the damage. Short hair may hide bald patches better. Chemo destroys rapidly dividing cells like cancer cells, and also destroys rapidly dividing cells like hair cells. What to do: Once chemo is stopped, hair will grow back, although often it will come back a different texture (e.g. curly when before it was straight) or a different colour. 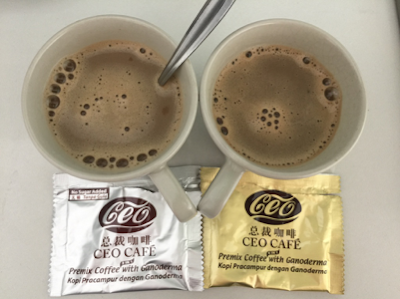 Consuming Shuang Hor Lingzhi at the same time as doing chemo can help your body generate more quickly new cells to replace the cells destroyed by cancer and so can help reduce the hair loss problem. PCOS is also an imbalance in male and female hormones. An excess of androgens can lead to ovarian cysts, weight gain, a higher risk of diabetes, changes in menstrual period, infertility, more hair on the face and body and hair thinning. What to do: Treatment include diet, exercise and consuming Lingzhi. Click here for the Testimony of how a lady eliminated her ovarian cysts without operation and medication. According to the American Academy of Dermatology, anabolic steroids (which are abused by athletes to bulk up muscle) also contributes to hair loss. The steroids can have the same impact on the body as PCOS. What to do: The condition should improve after going off the drug. - non steroidal anti-inflammatory drugs including ibuprofen and possibly antidepressants. What to do: Either lower the dose or switch to another medicine. Alternatively, take Shuang Hor Lingzhi instead, as all the conditions mentioned above can be successfully handled by Lingzhi. Vigorous styling and hair treatment over the years can cause hair to fall out. Because these practices can affect the roots, your hair might not grow back. What to do: Avoid these styles and treatments. Use conditioner after every shampoo, let your hair air dry and use heat-driven products no more than once a week. Try VCare Hair Repairing Serum, which works as hair conditioner and leave-on hair cream. This "impulse control disorder" causes people to compulsively pull their hair out. It often begins before 17 and is 4 times more common in women than in men. What to do: Some antidepressants may be effective. Behavioural modification therapy is also an option. It's common to start having hair loss when women enter their 50s and 60s. Experts are not sure why this happens. What to do: Cosmetic approaches such as scarves, wigs and hairstyles to cover up thin spots. Please email me at askfuiping@gmail.com to purchase Shuang Hor products to address your hair loss condition. I am an Authorised Distributor.